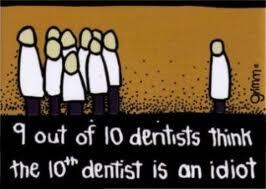 When the Voice-over man on the television advertisement says, “Nine out of ten dentists recommend Brand X,” do you ever wonder what the other guy recommends? Do you stop for a minute and think maybe that extra guy isn’t just some dumb bugger who should never have made it out of dental school? Maybe he’s an insightful maverick, years ahead of his time. Maybe, because of his unconventional views, he’s been losing high-end patients and is now contemplating a move to Africa where dentistry is still practised for the love of the smile. It’s possible, you know. In fact, in a hundred years, the Nobel Academy might just award that 10th guy the Prize for Medicine (posthumously) when scientific advances prove he was right, all along. Maybe they’ll even name streets and schools after him for his courage in remaining true to his oral health principles in the face of universal scorn. That can happen, also. Or maybe it won’t go that way. Maybe he’ll die, poor and alone, in a South African slum-hut village, consumed by Umqombothi* and despair, his unique knowledge unaccepted and lost to humanity for all time. Or it might just be a gender thing. That 10th dentist could be a woman, who, as a natural caregiver went into dentistry out of a genuine love for people and their hygiene. Maybe in dental school she found she had to be that much better than her male colleagues, so now, as a professional, she’s done more research on the subject. Perhaps she found some significant flaws in the formula for Brand X but was under enormous pressure not to publish her findings. However, when she was asked to make a recommendation, she felt compelled to tell the truth. Possibly this is putting a lot of stress on her home life, where her husband, an oral surgeon she met in university, is unsupportive, and she’s having an affair with the podiatrist across the hall. It could all end in a nasty divorce, and it might take her years to get her life back together when she finally kicks the podiatrist out and returns to her small hometown to assume her father’s family practice. It’s very possible. Of course, it could all be a corporate conspiracy. The original nine dentists could have been specially selected for their moral turpitude. They could have been taken on an all-expenses-paid weekend to the San Marcos Golf Resort in Chandler, Arizona. Once there, they might have been schmoozed with fast cars, expensive liquor and beautiful women. They could have played golf all day and partied all night. Then, on Sunday, they could have been told that the next junket was deep-sea fishing off the coast of Puerto Vallarta available only to those dentists who recommended Brand X. It would have been an easy choice for weak men. 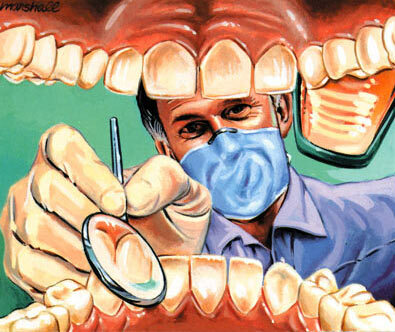 Perhaps, though, in a complete surprise, dentist # 4 may have fallen in love with one of the hookers. He might say he’s going to blow the whistle on the whole tawdry scam. Threatened with exposure, the corporate lackeys might have kidnapped the couple, taken them out into the desert and left them for dead. However, after days of enduring heat and thirst, the lovers could have reached the border. They could have smuggled themselves across and are now hiding out in an unnamed Mexican village, where they’ve set up a clandestine, cash-only dental practice. Meanwhile, in corporate America, the suits at Brand X might have found another dentist and think they’re safe from exposure. Unfortunately for them, dentist #4 might have just discovered a young girl who, even though she’s been brushing regularly with Brand X, has developed a cavity…. Do you ever think of these things when the toothpaste commercials come on TV? You don’t? You should. It’s fun. This entry was posted on March 6, 2013 by wdfyfe in Humor and tagged Humor, humour.